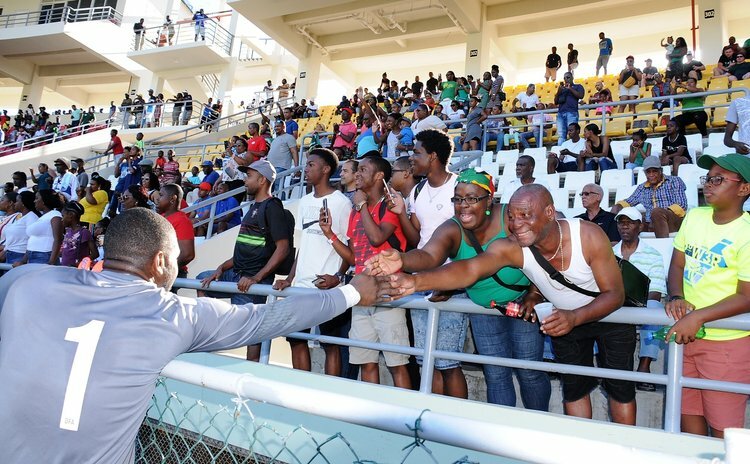 Dominica's men national football team played quite fabulously in their last match of the CONCACAF (Confederation of North, Central American and Caribbean Association Football) Nations League against The Bahamas at the Windsor Park Sports Stadium on Saturday March 23, 2019. The Dominica team came away with a 4-0 victory to end with seven points after cruising to 3-0 lead at the interval. Certainly sated, the substitutions of Donan Jervier (14) and Travis Joseph (16) in the second half had a debilitating effect on the team's performance in the second half. Whereas in the first half the local team threatened to score on every possession from the first minute, it was the visitors who created more opportunities in the second half so that captain and custodian Glenson Prince had to make one good save diving to his left. In the first half, however, it was difficult to pick out any one outstanding player, but as the match continued and into the second half, the calming influence, control and passing qualities of Briel Thomas (19) came to the fore. And he would complete the perfect match with a 30-foot right-footed scorcher in the 85th minute of play to advance Dominica's scoring. Dominica were always in the driving seat from the outset. But after more than 20 minutes there were concerns that the odd counter attack from the Bahamians could see Dominica on the back foot. Then the Bahamian goalkeeper misread one and just like that Julian Wade (7) made no mistake with a good finish along the ground in the 24th minute of play to the joy of the appreciative crowd. Five minutes later it was Travis Joseph under a right cross to finish with a brilliant header against the hapless Bahamian 'keeper. Dominica were not done, because another five minutes later (the 34th,) Wade caught a long ball on the left with one marker against him. His control was good. His turn and control eluded the defender and placed a lovely right footer across the goal into the far post for the 3-nil lead. There were many eye-catching individuals in that first half. People like Gylles Mitchel, Euclid Bertrand and Malcolm Joseph in defence always seemed well positioned, and their passing was more than 90% accurate. Anfernee Frederick, Chad Bertrand and Javid George were in the thick of the action marshalled by Briel Thomas in centre field. Thomas' first long shot at goal in the first half was more like cricket six into the side screen, but his second drive in the second half when Dominica looked a shadow of the team it had been in the first half was a real screamer which galvanized the crowd into its fourth large roar when Dominica looked far from scoring again. The team's performance was eye-catching. Credit to the coaching staff headed by Trinidadian Rajesh Joseph Latchoo for the transformation or the quality of players who have come through under their watch in the past two years.